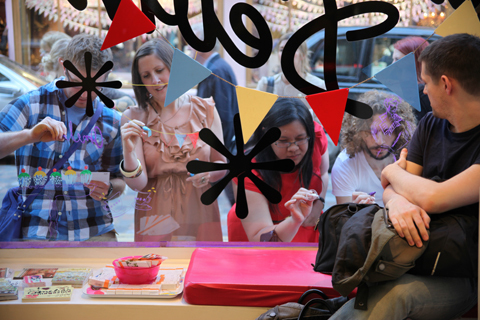 The first date on my ACOFI Book Tour kicked of on Tuesday 10th May at the Tatty Devine store in Covent Garden. 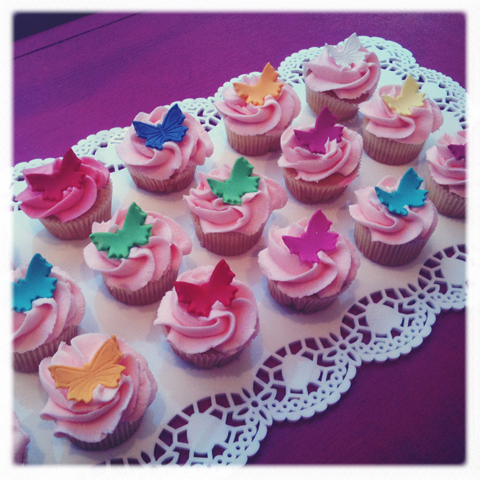 With window painting, Juiceology juices, Lahloo Tea, Dr.Hauschka samples and cupcakes galore courtesy of Cute as a Cupcake. 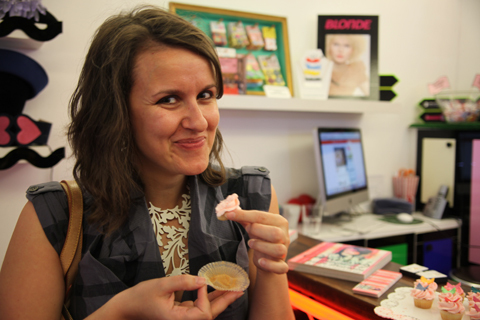 On Tuesday evening The ACOFI Book Tour got off to a flying start at the Tatty Devine store in Covent Garden. 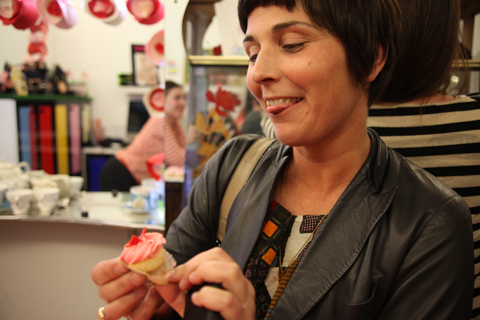 As people started to arrive Rosie, for sale Sonja and I laid out fragrant pots of Lahloo Tea to be drunk from beautiful retro china mugs and placed the gorgeous Cute as a Cupcake miniature cupcakes on a Tatty Devine laser cut doily: adorable in pink with butterflies on top. 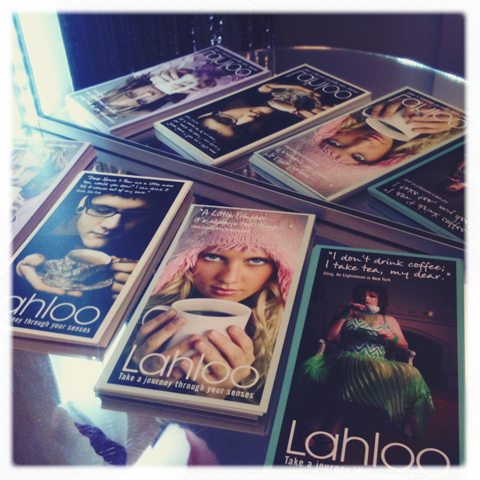 Sonja serves up some delicious Lahloo Tea. 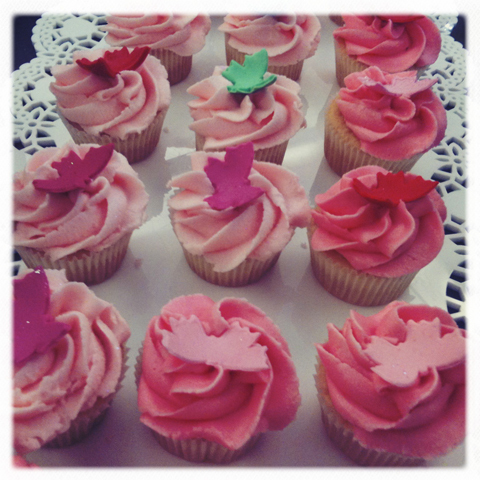 Cute as a Cupcake. Indeed. One of the first to arrive was Amelia’s Compendium of Fashion Illustration contributor Gemma Milly, visit who was unable to come to my first launch party because she swanned off to Canada for several months, site so it was really wonderful to finally meet her. 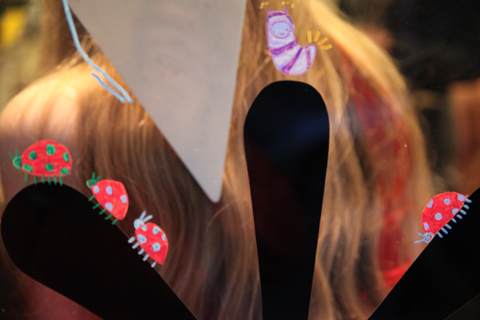 She wasted no time in grabbing a pen and settling in to some wonderful window painting. 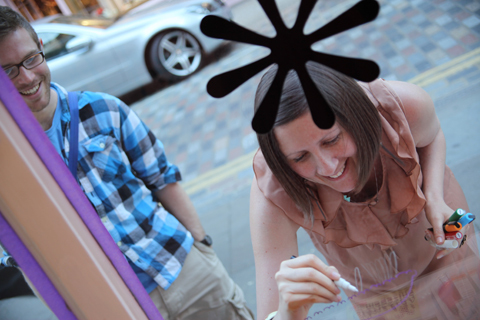 Gemma Milly gets down to some serious window painting. 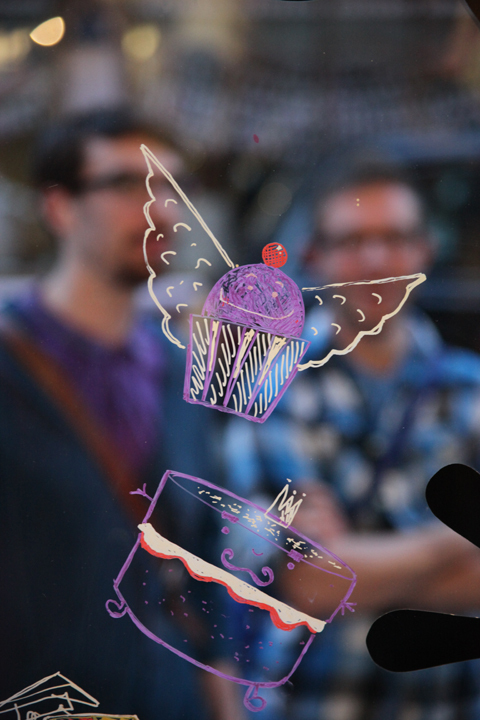 Soon she was joined by ACOFI illustrators Jo Cheung and June Chanpoomidole, also known as June Sees. 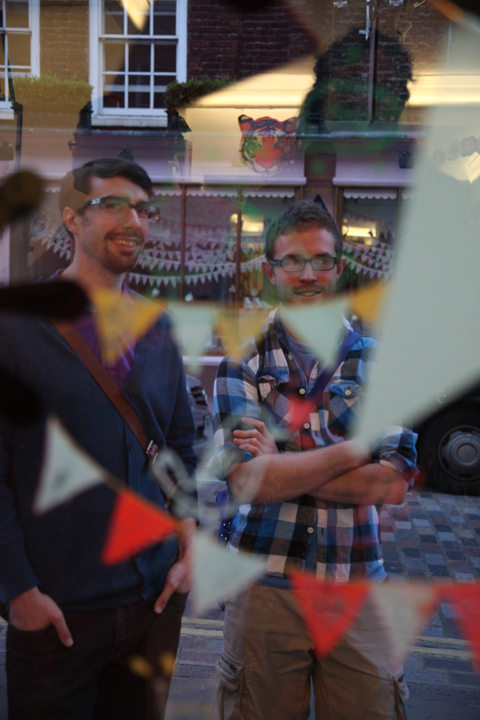 Both of whom studied at Westminster and are known for their very different but equally colourful illustrations. 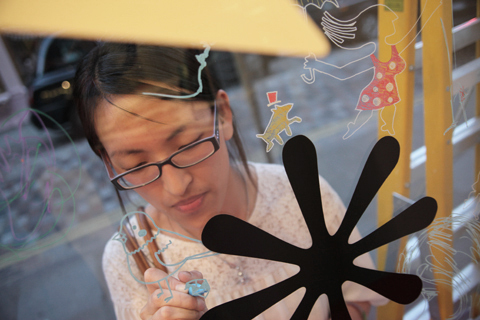 Jo Cheung painting one of her inimitable feathered friends. Here’s her round up. 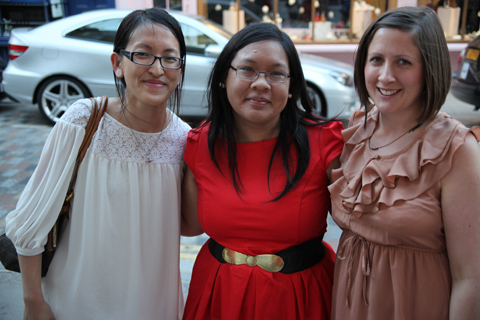 ACOFI illustrators – Jo Cheung, June and Gemma Milly. 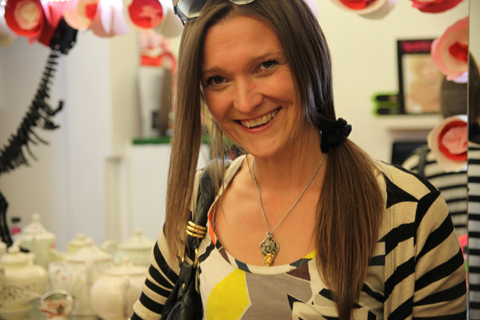 I finally got the chance to meet Esther Kneen, who has been a long term contributor to Amelia’s Magazine. 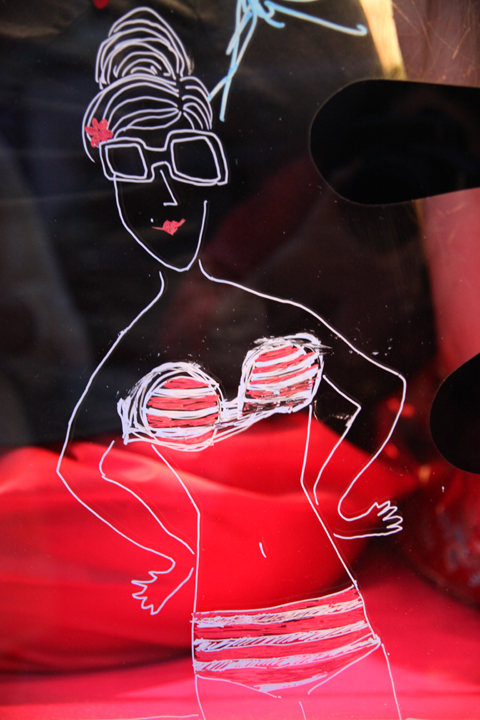 Just check out that stunning sewing machine tattoo! So marvellous. 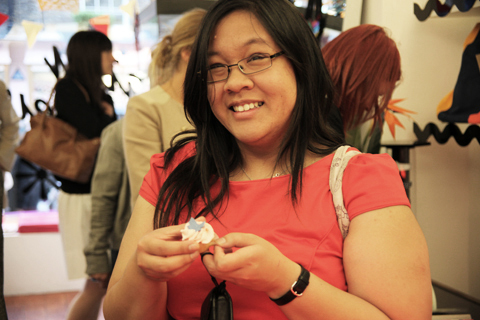 And she’s also written a nice little blog about the event. Maria Papadimitriou wearing some of her Plastic Seconds. 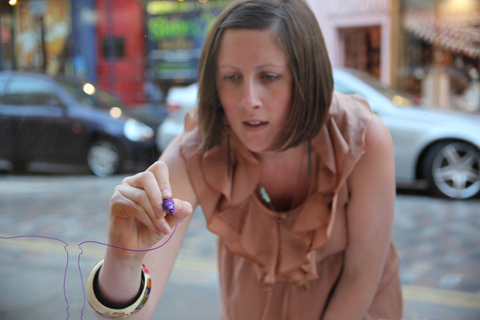 Also present was Maria Papadimitriou, who – as well as creating illustrations for Amelia’s Magazine – makes stunning and unusual jewellery from upcycled objects under the name Plastic Seconds, available in the ICA shop. 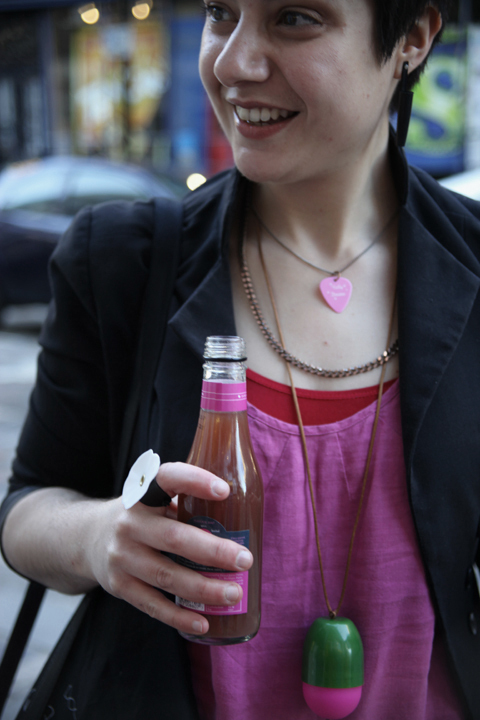 I particularly like her deodorant lid necklace which was hanging from her neck like a giant brightly coloured egg. I’m going to start saving my lids so she can make me something! She’s currently planning a wall for Supermarket Sarah: expect big things from this talented girl. 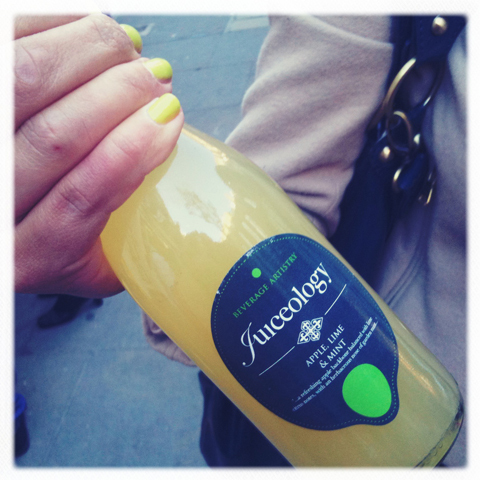 I found it most entertaining that so many people were brightly dressed to match the wonderful Juiceology drinks. Juiceology have kindly offered to donate juice for every single one of my book tour events, so please do come down and take the opportunity to try one of their stunningly flavoured natural juices, Apple, Lime & Mint, Lychee, Berry & Basil or Mandarin, Citrus & Cardamom. 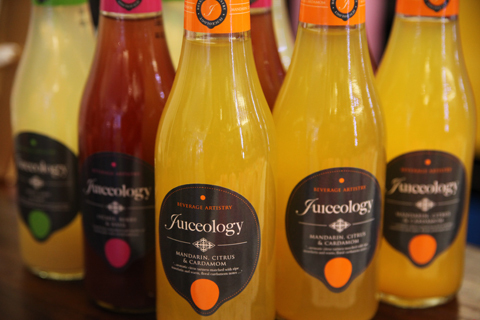 Each juice has been created according to the fine art of mixology, most often used to conjure up cocktails: it should therefore come as no surprise that Juiceology juices are so very special. I particularly love the Mojito-like kick of Apple, Lime and Mint, but it’s hard to choose a favourite out of the three. The Lychee, Berry and Basil is a stunning purple colour which in my mind can only mean good things, and all the juices contain a nice dose of very healthy Milk Thistle extract, renowned as a liver detoxicant. 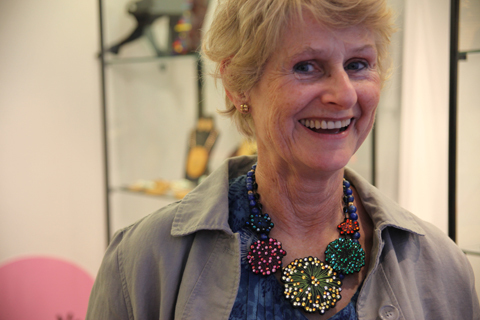 My mother became most enamoured of a wonderful Tatty Devine fireworks necklace, so we persuaded her to buy it, isn’t it amazeballs? 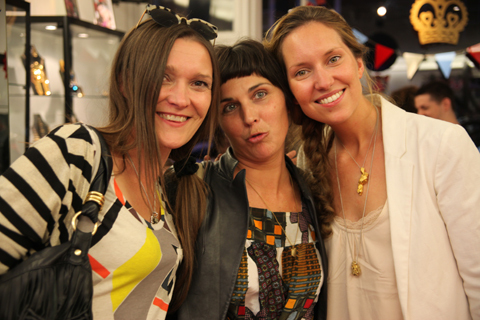 Emma Crosby, Sara Darling and Imogen Belfield. It was also a delight to see Veronica Crespi of Rewardrobe, London’s first slow wear consultancy, who I introduced to some new eco fashion friends. 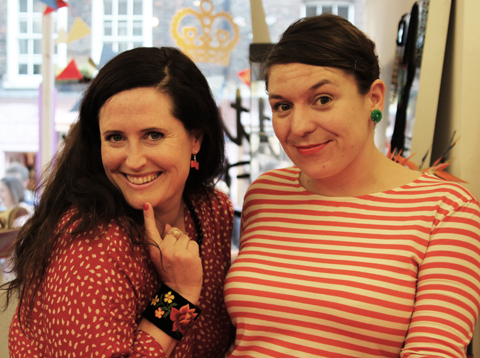 Myself with Rosie of Tatty Devine. 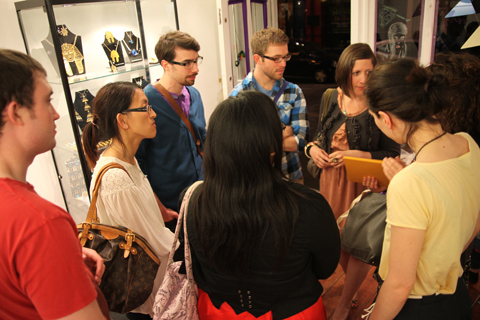 At about 7pm everyone gathered in the store and sat down to listen to the talk, which was a bit strange for me to do in such a relaxed setting as this: I am more used to lecturing at universities. But I tried to keep it as informal as possible and encouraged everyone to ask questions. 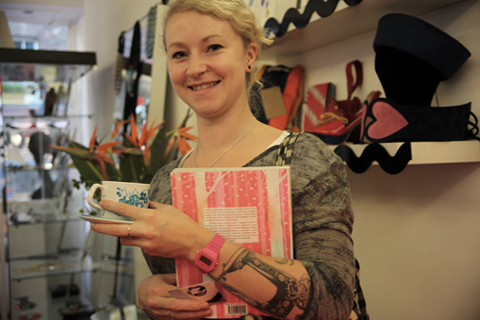 I talked a little bit about the history of Amelia’s Magazine, how I put together my two books, eco fashion and the importance of social networking for creatives. Afterwards everyone carried on networking and chatting and at the end of the night the atmosphere was so relaxed that no one really wanted to leave. I take this as a good sign! Especially without alcohol! 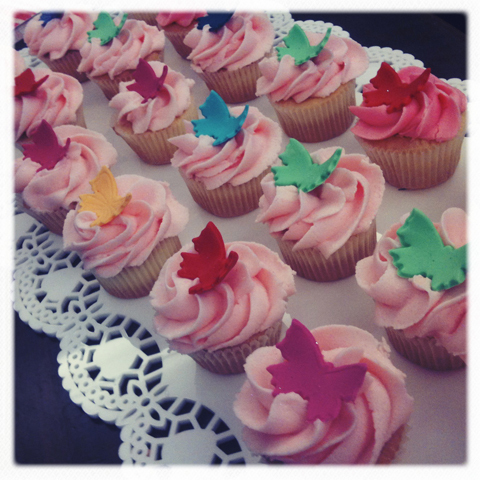 Everyone commented on how nice it was to have a booze free event: a mild sugar high being the only consequence of so much cupcake consumption. 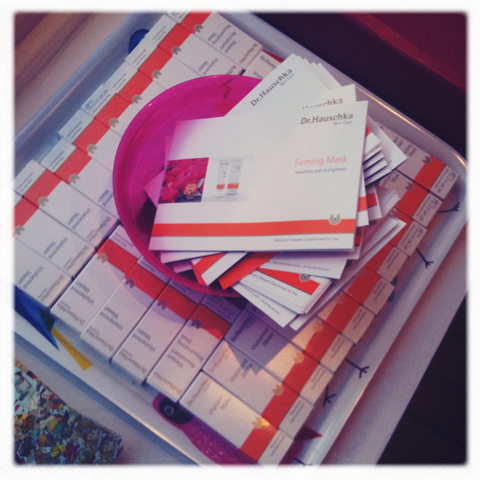 Dr.Hauschka once again donated some lovely freebie skincare samples for attendees to take away with them. Some of the boys were particularly intrigued to try out the Firming and Rejuvenating Masks, so I look forward to some photos of hairy faces sporting creamy masks very soon. 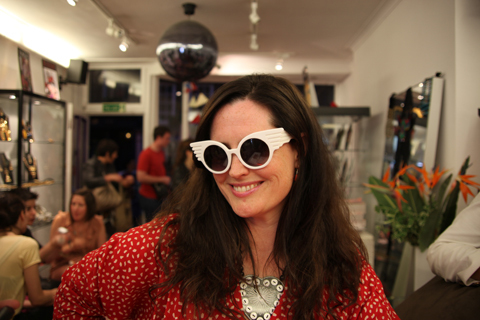 Jeremy Scott sunglasses available at Tatty Devine, love them. 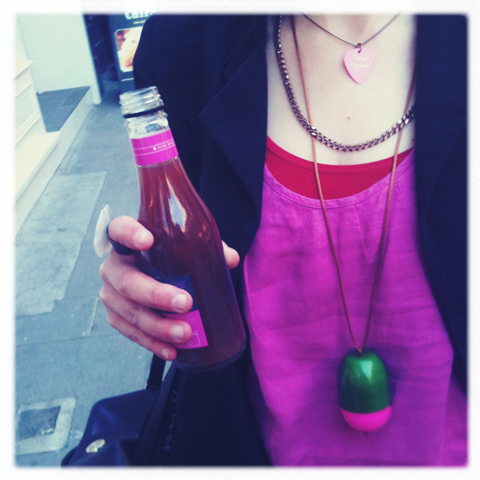 My necklace is also Tatty Devine. In the meantime if you would like to join The ACOFI Book Tour please do make sure you check in with the various places I will be visiting, and book where necessary so we can anticipate numbers. Read all about my future destinations here. 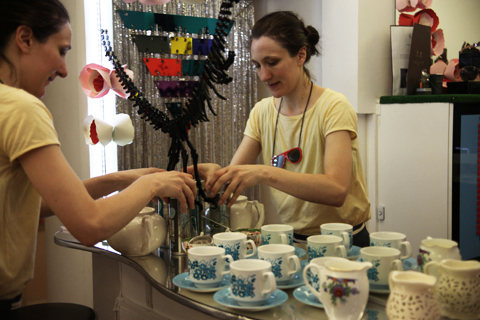 I will be back at Tatty Devine in Brick Lane on the last date of my tour on Tuesday 7th June. I look forward to seeing you very soon! 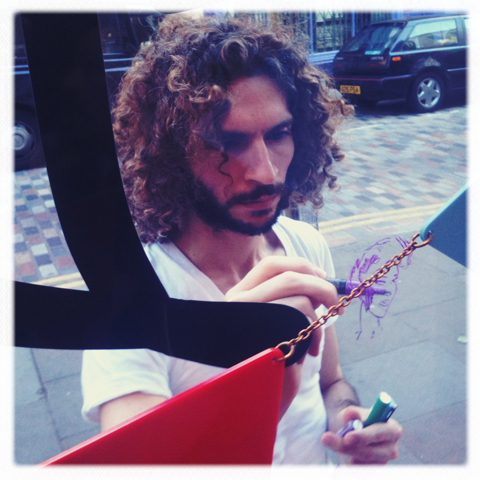 Our paintings will remain on the window of the Tatty Devine Covent Garden store at 44 Monmouth Street for the next few weeks, and you can buy ACOFI online here. 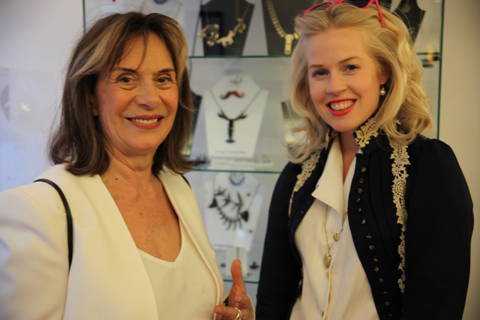 Read Tatty Devine’s blog about the event and Maria Papadimitriou’s lovely blog from the night. Jo Cheung even wrote a synopsis of what I spoke about! 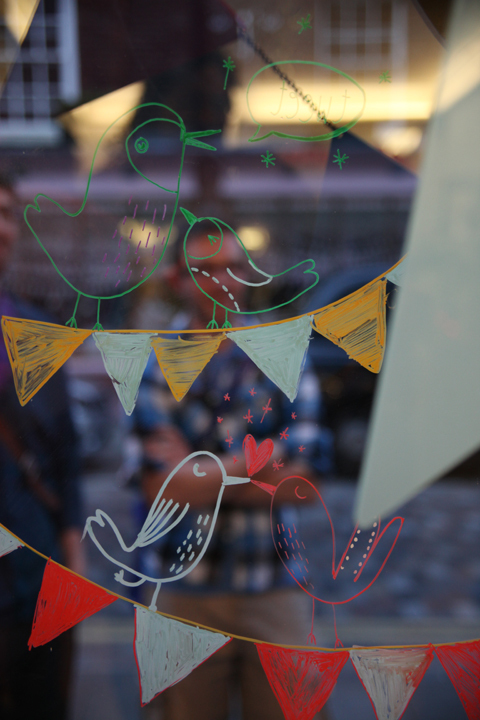 Tatty Devine and Rob Ryan collaborate again!